Business Insider's Jim Edwards got a letter from Bank of America/Merrill Lynch informing him that they'd instructed Twitter to remove two of his tweets on the grounds that they violated B of A's copyright. 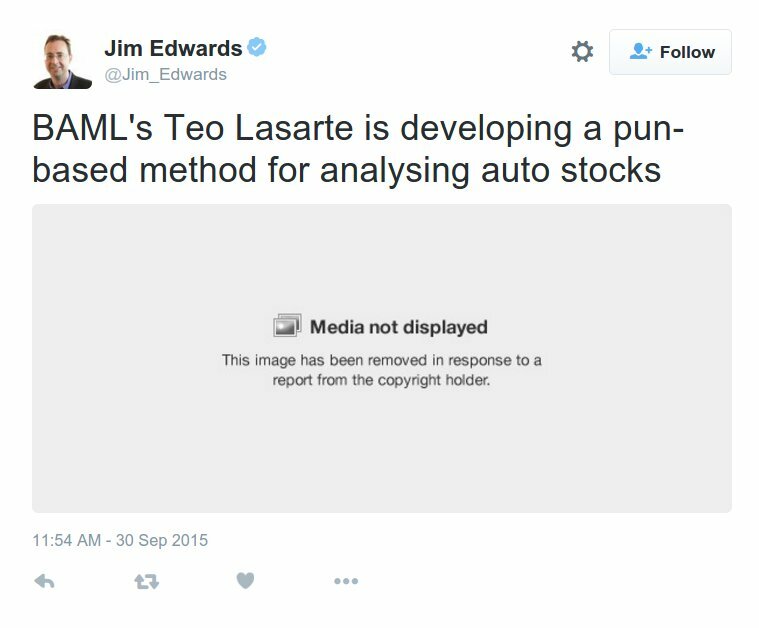 Edwards isn't even sure what was in the tweets, though he speculates that it might have been a screengrab of a funny caption on a BAML analyst's chart, which stands a good chance of being found to be fair use, especially in the context of news commentary. The takedown came from Attributor Corporation, a division of a copyright enforcement company called Digimarc. Though it bore the name of a Digimarc employee, Devon E. E. Weston, it's entirely possible that no human being ever looked at Edwards's tweet before sending out a DMCA notice on penalty of perjury. A recent victory by the Electronic Frontier Foundation in the Lenz/dancing baby case established the precedent that rightsholders must consider fair use before sending out takedowns, and if they fail to do so, they can be made to pay attorneys' fees if the case comes to court. Edwards has appealed his takedown using Twitter's DMCA put-back system, and it will be interesting to see what comes next.